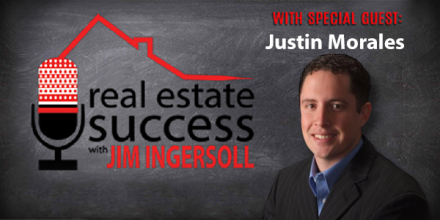 In this week’s Real Estate Success podcast, your host, Jim Ingersoll talks to Justin Morales about finding Financial Freedom by investing in Free Houses. An entrepreneur at heart, Justin Morales’ professional interests focus on the Real Estate, Manufacturing, and Oil and Gas industries. Justin’s current projects include: acquiring a Homevestors Franchise (We Buy Ugly Houses) in Florida & Alabama, leading a top-selling team of realtors at Keller Williams Realty Northern Colorado, operating a manufacturing company called Global Deign Assembly which specializes in LED lights and other RV industry parts, and partnering in five oil and gas projects in Texas and Kansas – all while managing assets of his own in seven States. Justin is a Board Member of MCE Social Capital and has helped provide over $100 Million in funding for 32 Countries. He is also on the board of the Finally Home Foundation, which helps support the families of adopted children. Justin is currently working on his memoir, “The Abundance Effect,” with plans for publication later this year. Justin is devoted to his family, which includes his wife of 11 years, Lindsay, and his two daughters, Haven and Arie. When he is not with his family, Justin is enjoying the beautiful outdoors all over the world as an avid hunter and fisherman. Ready To Live Your Own Success Story? Please leave us a rating or comments below or on iTunes, Stitcher, Google Play, YouTube or iHeart Radio. And feel free to share this post with your social media contacts! "CASH FLOW NOW" TRAINING GUIDE Yet? Enter your name and email so we can send you your FREE copy of "Cash Flow Now"
So we’ll never share your information with anyone.